Living in Alberta for 6 months taught me a lot about hiking and the outdoors. When I wasn’t in the office, you could often find me on foot in the gorgeous landscapes of Canmore and the Kananaskis Valley. There’s a reason why I spent the majority of my weekends in Alberta hiking in Canmore — it’s easily one of the most overlooked places to visit in the Canadian Rockies. Out of all of the dozens of adventures I had in the Canadian Rockies, the Canmore and Kananaskis hikes that I tackled were some of my favorites. At just an hour’s drive from Calgary, Canmore and the Kananaskis Valley are some of the most beautiful and underrated areas of the Canadian Rockies. They often get overshadowed by nearby Banff, Lake Louise, and Jasper National Parks. 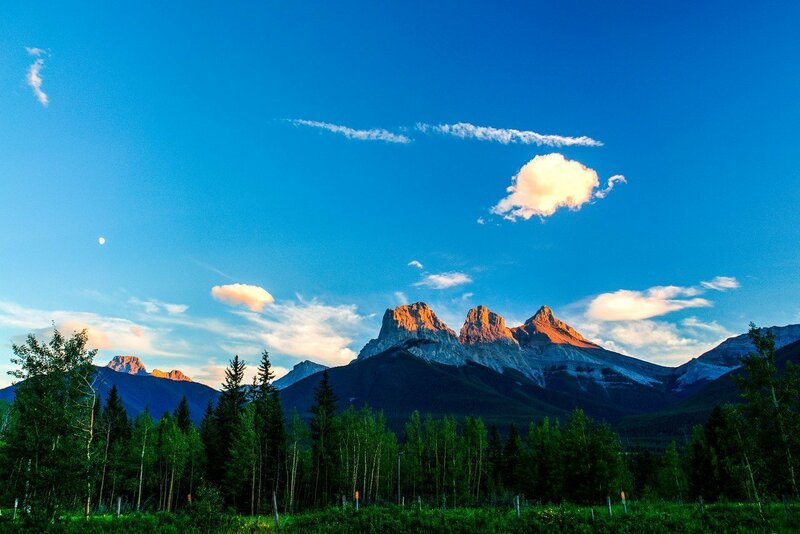 But in just 10 minutes of driving through Canmore, you’ll find similar jagged rocky peaks, stunning alpine lakes, and breezy evergreen forests. But don’t be intimidated by the stark peaks in the area. 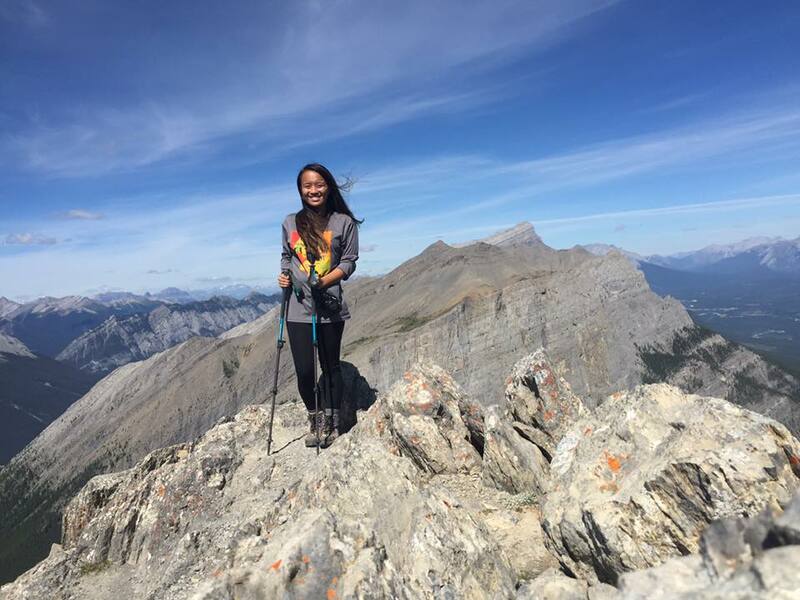 In addition to tough summit trails, there are plenty of hikes in Canmore & the Kananaskis Valley that are suitable for people who have never set foot on a trail before, too! To help you choose the best Kananaskis & Canmore hiking trails for your own skills and preferences, I’ve created this guide to 15 of the most beloved Canmore hikes, organized by difficulty and length. The Bow River Loop crosses through this picturesque bridge, which used to be part of the railway that ran through the Canadian Rockies. For beginner hikers, families, or a nice, easy walk around the Canmore town area, the Bow River Loop is the perfect hike. For most hikers, this 2-3 kilometer loop can be done in less than one hour. The Bow River Loop is a nice little trail that starts in Canmore town center, crosses the scenic Bow River Bridge and loops around along the Bow River. 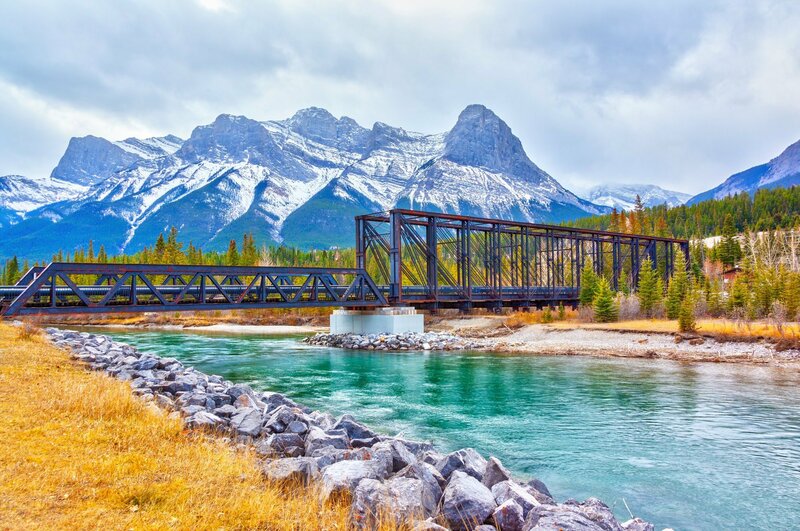 On the trail, you’ll catch scenic views of the town of Canmore, Mount Rundle, and the glimmering river itself. If you’d like more information on the Bow River Loop hike, read this information page. One of the most unique hikes in Canmore, the Grotto Canyon trail is a short, easy hike that takes you through huge rock structures and canyon areas. Here, local rock climbers can often be found scaling the vertical rock faces. After you’ve wandered past the rock climbers, you’ll hike through a boulder-filled trail and end at a waterfall, which makes for a really nice picnic spot or a scenic place to take a rest. For more information on the specifics of the Grotto Canyon trail, read this guide. One of the many lovely views from the Grassi Lakes trail. 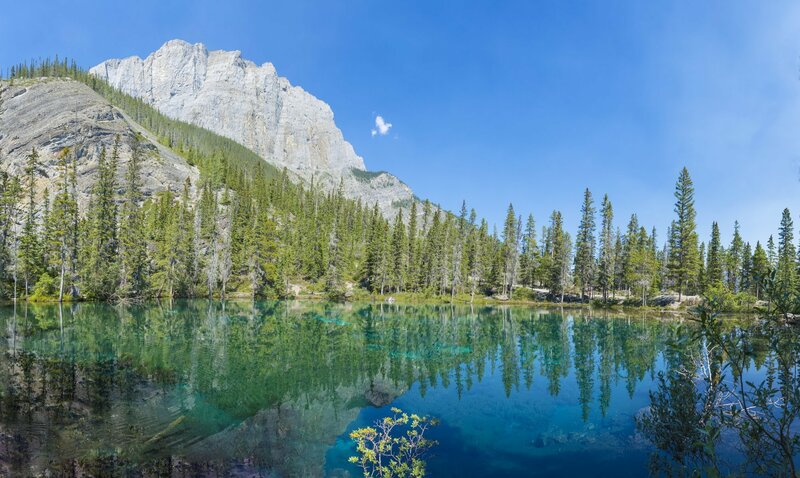 Grassi Lakes is one of Canmore’s iconic hikes and is a local favorite that’s perfect for hikers of all levels. It really brings out the best in Canmore hiking, as a family-friendly trail that offers both easy and more challenging ascents. The trail takes you to two deep turquoise alpine lakes and a waterfall surrounded by evergreen trees. It’s a very tranquil place to go for a short morning hike. For more information on the Grassi Lakes trail, read this short guide. This family-friendly loop trail winds around the banks of Quarry Lake, offering beautiful views across the water toward the mountains. The entire lake is surrounded by mountains and evergreen trees. In the summer, after your hike, you can also swim in the lake if the weather is warm enough! If you’d like to read more on this hike, head to this resource page. Yours truly on the summit of Ha Ling Peak. Ha Ling Peak’s trail is currently under construction and is closed to the public until further notice. Open year-round, Ha Ling Peak is arguably one of the shortest, coolest, and most picturesque Canmore hikes. It’s on the shorter end of the hikes in Canmore, at less than 6 kilometers out and back. But don’t let Ha Ling Peak’s short trail distance fool you: the hike is actually quite difficult, as you’ll ascend well over 800 meters in less than 3 kilometers. The peak itself rewards you with breathtaking panoramic views of the Bow Valley below. This hike, named after a tea house that was never actually built, is a gorgeous trail that has beautiful views start to finish. 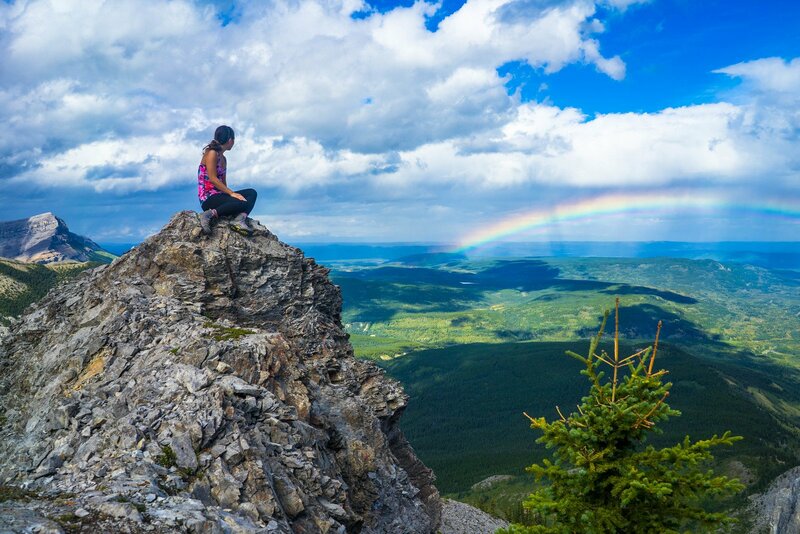 One of the more popular hikes in Canmore, this moderately difficult hike is a perfect half-day adventure for hikers looking for a bit of a challenge and the reward of stunning photogenic viewpoints. For more information about the Lady MacDonald hike, read the full guide on 10Adventures. For a challenging but accessible hike for beginners, Chester Lake is a fantastic trail that leads out to a picturesque evergreen-rimmed lake. The trail is largely through forests and trees, until you arrive at the lake, which has turquoise water and is surrounded by snowy mountains. This guide can help you find the trailhead and learn more about what to expect on the hike. A nice, challenging but doable hike for beginners, this trail takes you from Galatea Creek to the gorgeous Lillian Lake. On the way, you’ll pass through stunning valleys and over a picturesque wooden bridge. Lillian Lake is a tranquil, deep turquoise lake surrounded by a rocky shore, pine forests, and vertical rock faces. By far, Mount Yamnuska is one of my favorite adrenaline-pumping, muscle-throbbing hikes in ALL of Canada! This 11-kilometer trail takes you through an evergreen forest, up a steep rocky scramble, around a chain cliffhanger (seriously), and up to the summit of this iconic Canmore peak. It’s a whopping 900+ meters of elevation gain, so be ready for some SERIOUS uphills and downhills if you choose to tackle this one. I haven’t actually hiked this one, but I’ve heard awesome things about it from friends back in Calgary. This is a moderate to difficult trail that involves a bit of rock scrambling towards the top. The views from the trail and the summit are said to be absolutely incredible, sweeping down below to the valley and the highway below. Read this guide for more information and photos about the Heart Mountain Horseshoe hike. This summit trail is a challenging hike that eventually rewards you with some of the most incredible views in Canmore and Kananaskis. You’ll hike up a steep ascent, to a ridge overlooking the valleys and fellow peaks nearby. Here’s a complete guide to Centennial Ridge to Mount Allan. Easily one of the most beautiful summit views in the entire Canmore area, Smutwood Peak’s trail isn’t for the faint of heart. You’ll hike, you’ll scramble, and you’ll gawk and the stunning, stunning views of the ridge and the alpine lakes and valleys below. While it’s best to do this in the summer or fall, you can tackle the hike as early as spring with the proper equipment. Here’s a great guide to Smutwood Peak that details a bit more about the route itself. Canmore is a year round destination! While most people flock to Canmore in the summer months (July through August), there are things to do here all year. In the summer, there are hiking and camping opportunities (like this ones in this post), while in the winter, there are amazing places to try snow sports. Wildlife is rampant in Canmore. Chances are, if you’re in Canmore for any significant amount of time, you’ll run into some wildlife. We’re talking anything from chipmunks to grizzly bears. When hiking, always bring bear spray with you and walk with a buddy or a group to protect yourself. And, of course, DO NOT FEED OR APPROACH ANY WILDLIFE. EVER. There can be ice and snow on the trails year round. Just because the weather is nice outside does not mean that the trails are free and clear of ice. If you’re hiking outside of June-September, it’s a good idea to bring over-the-boot crampons and sturdy trekking poles for extra support, and don’t be afraid to cancel a hike or turn around if conditions aren’t optimal.